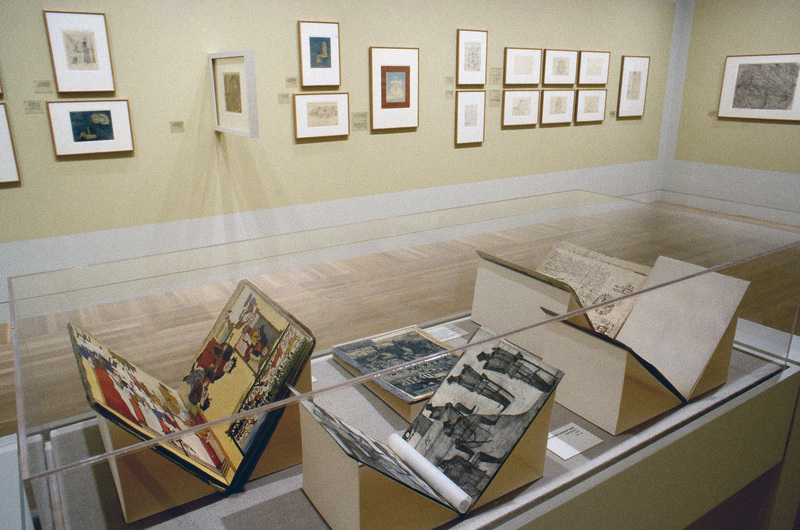 Organized by The Drawing Center, New York, this is the first American exhibition of a group of works amassed in the early 1900s by the psychiatrist and art historian Hans Prinzhorn (1886-1933). Based at the University of Heidelberg, Germany, the collection consists of drawings made by psychiatric patients who suffered social exclusion, psychic illness, and isolation—experiences that are common, yet often erased from collective memory. Drawings in the exhibition chronicle the painful struggle to reconcile personal interior existence with the demands of external forces. The exhibition consists of over two hundred drawings and books and marks the last time that the collection will travel prior to the opening in 2001 of a museum at the University of Heidelberg dedicated to the collection. The exhibition's title refers to Sigmund Freud's concept of the unconscious. According to Freud the "wunderblock" represents the way in which the psyche records material. He adopts the metaphor of the "wunderblock," which is a child's toy consisting of a thin sheet of clear plastic covering a thick waxed board. The user can write or draw on it with any pointed instrument, pressing through the sheet of plastic, making traces on the surface below. As soon as the sheet is lifted, the image above disappears, while traces of it remain on the wax surface underneath. Thus, the "wunderblock" alludes to the way the psychic system, which, having received transmissions from the outside world, remains unmarked by those impressions that then pass through it to a deeper layer where they are recorded as unconscious memory. Therefore, it illuminates the mechanism by which the repressed becomes the prototype of the unconscious. The Prinzhorn Collection was assembled during an era of new research in mental illness. Dr. Prinzhorn was at the forefront of methodological changes in treatment and he was also an advocate for the aesthetic legitimacy of the drawings in his collection. The collection was assembled with the idea of opening a museum dedicated to it in the 1920s, but due to unrest in Europe, Dr. Prinzhorn's plan for a museum was not realized during his lifetime. The Prinzhorn Collection: Traces upon the "Wunderblock" introduces a collection of drawings that have been influential to the theorization and practice of the avant-garde and some of the most important art movements of the twentieth century. Concurrent with Dr. Prinzhorn's research in mental illness were the activities of many artists who attempted to transgress existing visual practices by exploring spontaneous acts of creation and the unconscious, seeking what Paul Klee called "the primal beginnings of art." With the publication of Prinzhorn's Bildnerei der Geisteskranken ("Artistry of the Mentally Ill") in 1922, these drawings became a source of inspiration for numerous European artists, between World War I and II, and for a great number of American artists after 1945. The Prinzhorn Collection had a particular influence on the theorization and practice of automatic writing and drawing undertaken by the Surrealists. This exhibition is curated by The Drawing Center's director Catherine de Zegher, in collaboration with Inge Jádi, director of the Prinzhorn Sammlung at the University of Heidelberg, and Laurent Busine, the director of exhibitions at the Palace of Fine Arts in Charleroi, Belgium, who organized an exhibition of the collection in 1995, which traveled to the Hayward Gallery, London. The exhibition is accompanied by a ninety-page catalogue with essays by Bracha Lichtenberg Ettinger, Hal Foster, Sander L. Gilman, and Allen Weiss. The Prinzhorn Collection: Traces upon the "Wunderblock" was organized by The Drawing Center, New York, and was made possible by a generous grant from The Howard Gilman Foundation. Additional support has been provided by the National Endowment for the Arts and the New York State Council on the Arts. In Los Angeles, the exhibition is supported by a gift from John Morton and Laura Donnelley-Morton and the Good Works Foundation. Additional support was provided by William James Fadiman and by Judd Marmor, M.D. Nationally, this exhibition was made possible by a generous grant from the Howard Gilman Foundation. Additional support has been provided by the National Endowment for the Arts and the New York State Council on the Arts.